BCCIC > How did we get here? Following the launch of the Sustainable Development Goals (SDGs) the world’s focus turned to implementation – how are we going to achieve these ambitious goals? Knowing that groups throughout Canada have been working on sustainable development issues for decades, the British Columbia Council for International Cooperation (BCCIC) decided to take an appreciative approach by looking at how civil society organizations (CSOs) in BC were already implementing and advancing the new global goals. The results were surprising. An ‘invisible mosaic”of over 2000 groups already working on one or more of the SDGs was discovered that had previously been hidden from to the public, politicians and even many of the organizations themselves. located and the regions and countries they are working in. The idea is that the map will allow groups and the general public to more easily connect with each other and build collaboration around the SDGs. engagement with key stakeholder groups including First Nations, faith-based groups, and the private sector. The following background report provides more details on the key themes and recommendations that emerged from the SDG roundtables, beginning with an overview of the roundtable process. Subsequent sections provide a description of the invisible mosaic revealed through the meetings and an overview of the value, opportunities and limitations that participants saw in the framework. 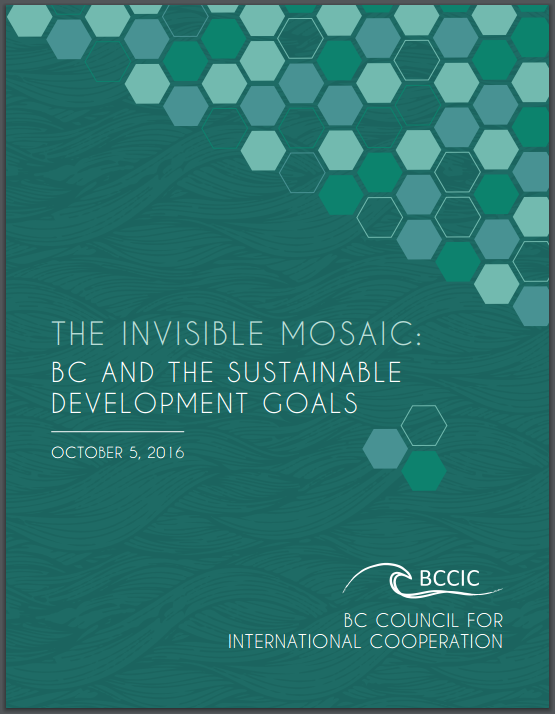 The report concludes with participants’ recommendations for key actions needed to realize the potential of the SDGs and make the goals useful for civil society groups in BC. 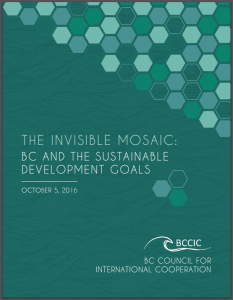 We believe that the findings and recommendations contained in this report offer a unique opportunity for BC to become a leader in achieving the Sustainable Development Goals through supporting the invisible mosaic of BC civil society groups who are already moving us towards a better world.